Blu-Lina Organic Spirulina by RegenaLife is a highly nutritious and easily digested algae water plant. Spirulina has been an important and rich food source for peoples of Africa and the America's for centuries. In modern times, it earned widespread popularity as a dietary supplement when NASA began including it in the space diet of astronauts. Spirulina contains unusually high amounts of vegetable protein (3-4 times higher than fish or beef) and iron, which may be particularly useful for vegetarians. Spirulina contains all 8 essential amino acids. It is rich in vitamins, minerals, enzymes and anti-oxidants. It contains high levels of phycocyanin, carotenoids which protects cells (5 times more than carrots, 40 time more than spinach), and high volumes of essential fatty acids. Spirulina contains 65% protein and amino acids including the essential fatty acid gamma linolenic acid (GLA). Spirulina is known to be a prebiotic, encouraging the growth of helpful bacteria in the gut. Studies have noted the beneficial effects of spirulina supplementation for blood lipid profiles and antioxidant capacity in patients with type 2 Diabetes. 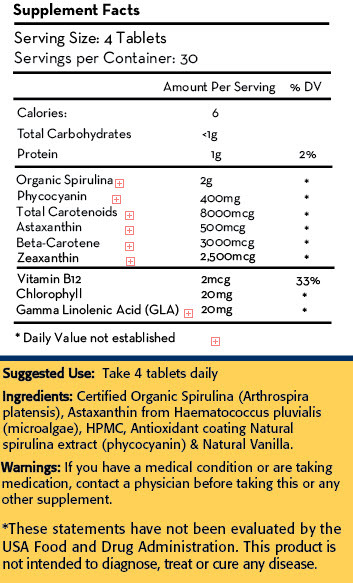 Spirulina also contains Omega 3-,6 and 9s and is especially high in Omega-3s. Studies confirm that spirulina strengthens immunity; it improves the activity of white blood cells, stimulates antibodies and increases the population of natural killer cells. It is a potent anti-viral food. Spirulina is high in chlorophyll, which builds healthy blood, resulting in better circulation. It may also prevent premature aging removing toxins from the blood and boosting the immune system. Blu-Lina Organic Spirulina by RegenaLife combines the powerful antioxidant properties of Zanthin Natural Astaxanthin to form a powerful superfood! Spirulina is a natural “algae” (cyanbacteria) powder that is incredibly high in protein and a good source of antioxidants, B-vitamins and other nutrients. When harvested correctly from non-contaminated ponds and bodies of water, it is one of the most potent nutrient sources available. It is largely made up of protein and essential amino acids, and is typically recommended to vegetarians for its high natural iron content. It is often touted for its high B-12 content, though there is a lot of debate about if this particular form is a complete and absorbable form of B-12 and I don’t recommend it completely in place of animal products. Spirulina is a great source of other nutrients including: vitamins B-1(thiamine), B-2 (riboflavin), B-3(nicotinamide), B-6 (pyridoxine), B-9 (folic acid), vitamin C, vitamin D, vitamin A and vitamin E. It is also a source of potassium, calcium, chromium, copper, iron, magnesium, manganese, phosphorus, selenium, sodium and zinc. Spirulina contains many pigments which may be beneficial and bioavailable. Spirulina was tested by an independent laboratory and found to have an ORAC (Oxygen Radical Absorbance Capacity) of over 24,000 which is 4x the ORAC score of blueberries. The ORAC score is generally used to measure antioxidant ability and concentration in different foods. Spirulina is also incredibly high in calcium with over 26 times the calcium in milk, making it excellent for children, the elderly and during pregnancy. Some research has suggested that Spirulina may be helpful for those with allergies and allergic reactions. Spirulina’s phosphorus content makes it helpful as part of a tooth re-mineralization regimen. Spirulina can bind with heavy metals in the body and help remove them.